Can you believe it... Spring is finally on the way! After the winter we've had here in the Southeast, I'd say we're more than ready to welcome this warmer weather with open arms. For me, the shift in seasons from winter to spring always signifies a fresh start. And for most, a fresh start this time of year means spring cleaning! As a professional organizer, spring cleaning is sort of like my super bowl, and here at Real Order, we pride ourselves on winning... ha! Each year, we strategize new ways to help our clients streamline their lives, and spring cleaning season is the perfect time to start to get organized - or even re-organized! I hope this month's spring cleaning themed newsletter helps motivate you to take advantage of the warmer days by cleaning and organizing! Then, you'll really be able to sit back, relax, and enjoy those long summer days. If we can help get you organized for spring, and on your way to your own fresh start, please contact the Real Order team today! Get rid of the excess... Go through all closets, drawers, closets, crawl spaces, etc. and dispose of anything you haven't used in the last year. Check out our recent post on surprising items you can recycle, so nothing is thrown away that doesn't really need to be. Clean those nooks and crannies. Gather your arsenal of cleaning products and make sure you tackle all of those storage spaces - no matter how tiny - while everything's removed from them, before you put back the items you're keeping. Be strategic! Consider how you use all the items you're keeping. Are you putting them back into the space that makes the most sense for them? Now's the time to move things around to ensure they're placed in just the right spot. Start from the top and work your way down. Begin your cleaning spree by looking up - dust your ceiling fans and light fixtures (even the light bulbs) first, next, wipe down the crown moulding, and then wash/clean window treatments. Do all you can in a space before you focus on the floors. Think creatively! Don't just clean the most obvious areas; spring cleaning is all about attention to detail. Consider your laundry appliances and dish washer (yes, even your washers need occasional cleansing! ), vacuum mattresses and upholstered furniture to free them of dust, and wipe down baseboards and even staircases and railings. Protect and they'll serve... Protect your surfaces by properly safeguarding them against future dirt and dings so they'll last years longer. Place felt discs on the feet of furniture that sits on hard surfaces to protect it from scratches, polish wood with dust-fighting solutions, so build-up doesn't occur, and line drawers and cabinets. 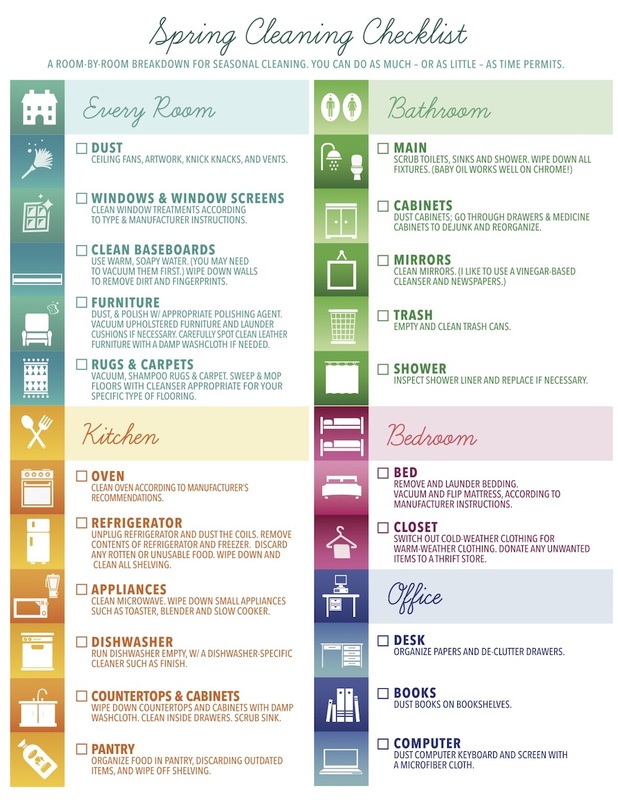 Click here for a full size version of this helpful checklist. Keep record of all your online accounts, including log in info in the event you forget it, or need a trusted friend or family member to access your account. If you utilize photo sharing sites, consider what you make public and what you keep private. Streamline your accounts online by keeping up with just one or two e-mail addresses, and utilizing them for specific purposes. Take a bit of time to "unsubscribe" or "edit settings" on e-mails you no longer want, or ones you want to see less of. If you enjoy all that Social Media has to offer, condense all platforms using a tool such as HootSuite to bring all of your profiles, and newsfeeds together in one place. Take the time while you're in a cleaning and organizing frame of mind to tidy up your online presence. After this, you'll be starting out fresh in all realities!